Everyone knows what a veterinary surgeon is but how many people outside the industry have heard of an 'SQP'? I certainly hadn't before I joined VioVet. 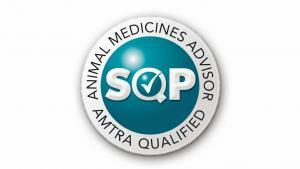 "A Suitably Qualified Person (SQP) is an animal medicines advisor, a legal category of professionally qualified persons who are entitled to prescribe and/or supply certain veterinary medicines under the Veterinary Medicines Regulations." I've worked at VioVet for about 18 months now and have experienced nearly all areas of the company. I started off in the warehouse, stocking in and labelling medication, along with picking and packing orders and after a couple of months, moved into the office. I was trained as a member of the prescriptions team initially, loading scripts and communicating with both customers and veterinary practices before becoming part of VioVet's Customer Service Team on the phones. From there, I got involved in the Professionals Club which was set up and is managed by fellow E-SQP, Gary Gregory. I love being able to get involved with as many areas as I can, enjoying the variety of tasks presented and having the flexibility to help out in different departments if needed. Before I came to VioVet, I spent ten months working in the laboratories of a pharmaceutical company in Hertfordshire and then three years at Nottingham University studying Biology. From a young age I have been interested in creepy crawlies and this developed into a great interest in parasitology at university. When the opportunity arose to undertake a veterinary qualification through VioVet, I was extremely excited- the life cycles of parasites from the perspective of our pets is very different to that of humans as I was used to. In November I qualified as an E-SQP which enables me to provide you with professional advice for your horses and companion animals such as dogs and cats. It makes me feel very proud to be legally capable of prescribing and supplying certain medicines such as flea and worm treatments but working for an online business, I feel that the most important part of my role as an SQP is to share what I have learned with you, our VioVet customer. On the 28th and 29th of January this year, I attended the AHDA 29th Annual Conference in Birmingham after receiving an invite towards the end of last year. It turned out that in 2013, over 1000 people took the exams to become an SQP; over 800 achieved a qualification and in the E-SQP group, I gained the third highest mark. I was inspired by the passion and expertise of the many speakers and it really hit home how difficult it is to address problems in animal health without working closely with customers. There are real issues we need to tackle, especially parasitic resistance and risk of human infection from animals that are widely unknown or misunderstood. I really encourage anyone wanting advice for their pet, whether it be nutritional, parasite control or other areas, to contact us. As mentioned, my colleague Gary is also qualified as an E-SQP and has a list of other attributes that make him a valuable source of information for dog owners in particular. You will also have the support and expertise of our vet, John Cousins, if Gary and I are unable to answer your questions. We are working to make VioVet known for more than just great savings, speed and service. We want VioVet to build personal relationships with more customers where our qualified and friendly team play an essential part in ensuring your animal's health.